The humpback whale. The bald eagle. The American alligator. These thriving species were saved from extinction by the Endangered Species Act. While few dispute its effectiveness in restoring endangered animal populations, some industries, including mining, logging and farming, say the law stymies business. Now the Trump administration is moving to revamp it. One change would allow the government to consider economic factors, not just science, in deciding which species are protected. 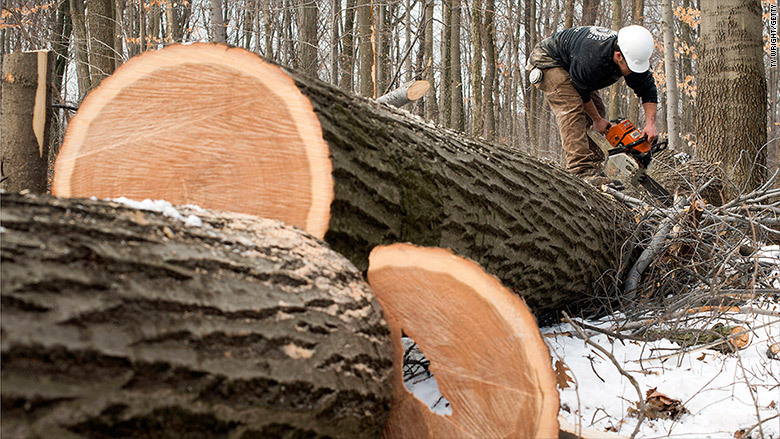 "I don't know of any industries that are against it [the act]," said Danny Dructor, executive vice president of the American Loggers Council. "But there's always room for improvements." The act was signed into law with bipartisan support by President Richard Nixon in 1973. But it's failed to modernize with the times, critics say. Dructor argued that the focus on saving wildlife leaves little focus on surrounding economies and communities. "How many acres do we really need to keep aside to save these species?" Often, the rules conflict or don't make sense, Dructor said. To save the red-bellied woodpecker, he said loggers were made to remove forest underlay so that snakes had no route to the woodpeckers' nests in the trees. In April, the Louisiana pine snake was listed as threatened because of the loss of its longleaf pine forest habitat. In a statement, the Center for Biological Diversity said this was due to "urbanization, agriculture and logging." "Are we going to help build a habitat for the snake?" Dructor said. "Which comes first? And where is the people component in all of this?" Under the act, 1,274 species are classified as endangered, and 387 more are threatened," meaning they are at risk of becoming endangered. The act forbids what's known as "take" of endangered species. It's illegal to "take" an endangered species directly, through hunting or trapping, but also indirectly, through building on protected land or performing certain business activities that risk harming a species or its habitat. Threatened species also receive "take" protection, thanks to a move by the US Fish and Wildlife Service. Under the Trump administration proposal, threatened species would no longer receive blanket protection, but would be considered on a case-by-case basis. "This is a sweeping change of regulations," said Noah Greenwald, endangered species director at the Center for Biological Diversity, a nonprofit that works to protect endangered species. "It's stripping threatened species of protection. It's incredibly shortsighted and small-minded." Those who want to see the act reformed say some species stay listed too long even after they've recovered from the threat of extinction. 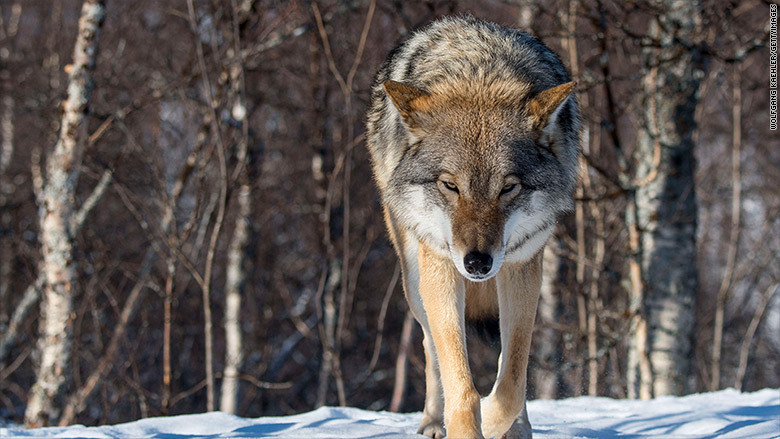 Critics cite the gray wolf, which has made an incredible recovery in the West and Midwest since being on the edge of extinction in the 1970s, said Ryan Yates, director of congressional relations at the American Farm Bureau Federation, a group that represents farm and ranch families. But the gray wolf is still listed as endangered. Yates said that's harmful to small family farmers, who frequently find roaming packs of wolves devastating their livestock. The farmers would violate the "take" protection by killing them. "Farmers are fearful of their lives, of their children's lives," Yates said. "And they're watching species like wolves sport-hunting their dairy cows." Dave Owen, professor of environmental law at the University of California Hastings, said keeping species listed is key to their full recovery. "Most hover on life support. The longer they're listed, they get gradually better," he said. The act has prevented extinction for species including the grizzly bear, the peregrine falcon and the gray wolf. "How many acres do we really need to keep aside to save these species?" said Danny Dructor of the American Logger Council. Reform #2: "Designated critical habitat"
The Trump administration is also targeting "designated critical habitat." As the act stands, businesses and developers have to consider not only the habitat of the creature, but also its future habitat where it may have to migrate to recover. If a business intends to work in that area, it must consult with the FWS. That can take two years. "Projects routinely get adjusted," said Owen. "There's a ton of deal-making and negotiation and accommodation. But projects almost never get stopped." But the habitats are often big and loosely defined, said Rob Henneke, general counsel at the Texas Public Policy Foundation, a conservative think tank. Henneke is consulting on a lawsuit concerning a listed bird, the golden-cheeked warbler. In central Texas, he said, the bird spans 28 counties, and its habitat is five or six times greater than it was before recovery. He said that the FWS has never specifically defined what the protected habitat is, but that anyone with cedar trees on their property runs a risk of a penalty for developing on their land or for clearing trees. "It limits the potential for the land," Henneke said. "The current act is punitive for disturbing a species. The effect is that it gives a disincentive to landowners to conserve." "It shouldn't be the role of the federal government to regulate every living and breathing thing in our country." Supporters of the Endangered Species Act say having protected habitats helps the economy — increasing land value, recreational space and water quality. And conserving species has direct economic value. Some, like salmon, are commodities. Others, like wolves, drive tourism. Yellowstone National Park, where the wolves can be seen, hosts millions of visitors yearly. Other species are of value for scientific and medical purposes, such as the Pacific Yew Tree, key to a breast cancer drug called taxol. Owen, the attorney, also pointed to the Tellico Dam project in Tennessee, which was halted by the Supreme Court because of a 3-inch protected fish called the snail darter. In 1979, Congress and President Jimmy Carter passed an exemption to the Endangered Species Act and the project went ahead. By 1982, the dam wasn't producing any electricity -- or economic value -- and ever since, it's been used for other purposes. The Trump administration proposed the changes July 19. After a two-month public comment period the government will make a final decision.